The most famous city in Turkey is fun to explore for dozens of reasons–but the food in Istanbul definitely belongs at the top of any list discussing the city’s attributes. 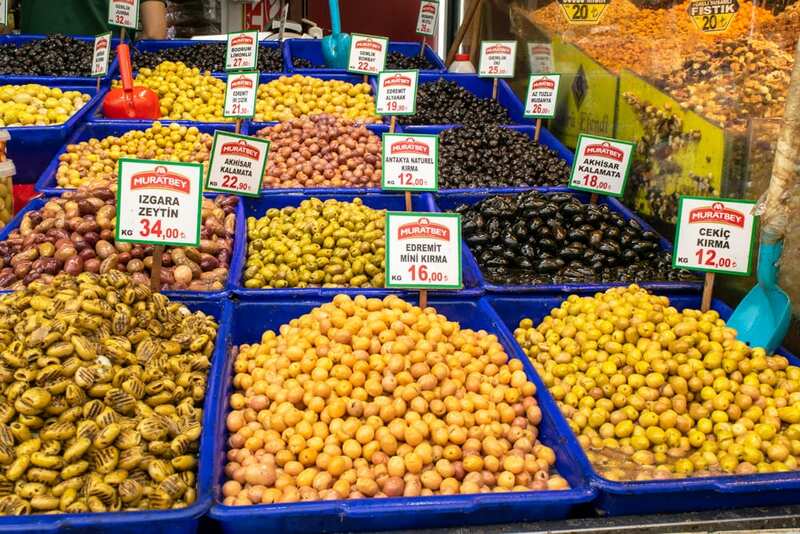 Istanbul has been a central component of the global food and spice trades for thousands of years, and nothing makes that more obvious than stepping inside a food market or restaurant in Istanbul. Incredibly varied, historically interesting, and very delicious, the best food in Istanbul pulls influences from all over the world and melds it into a food scene that is truly unique. If you’re heading to Istanbul and are ready to exercise your taste buds, here’s what you have to eat in Istanbul. 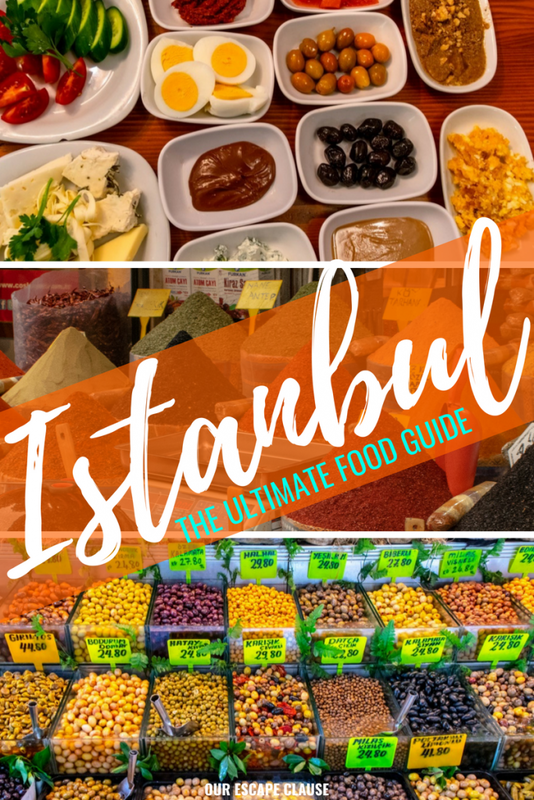 A full list of all the best food in Istanbul that is worthy of your attention could fill a book–but assuming that you don’t have a lifetime to explore the city, here are some foods you need to prioritize eating in Istanbul. 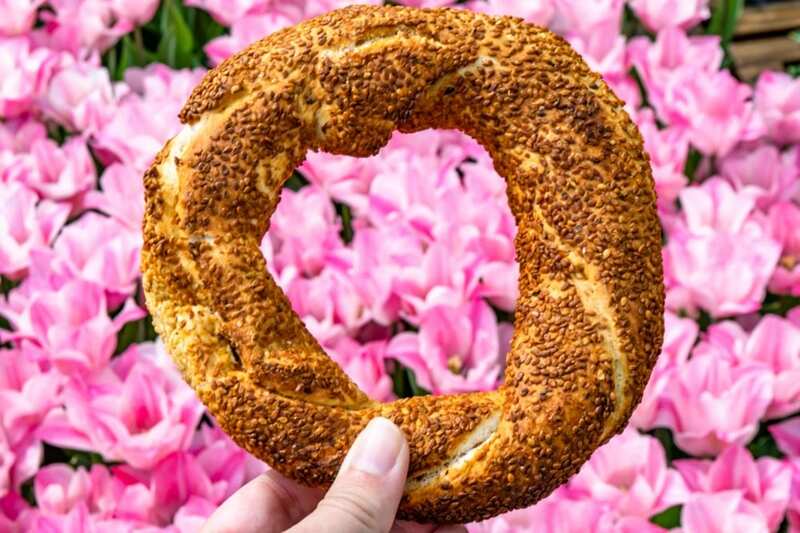 Similar to a bagel or pretzel, this chewy, round bread is covered in sesame seeds and is one of the most popular street food snacks in Istanbul–you’ll find simit carts on nearly every corner in the city! Turkish meatballs are incredibly popular–you’ll find a plate of them on nearly every menu. 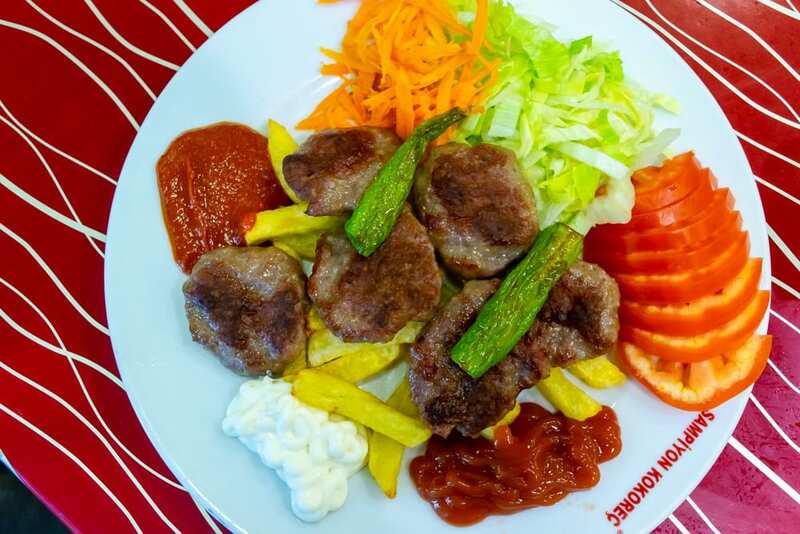 In Turkey, Köfte is usually made from lamb, beef, or a combination of both types of meat, and is served with grilled peppers (yum), spicy sauce, and usually bread or rice. Ah, döner–almost any world traveler will be familiar with what is arguably one of Turkey’s most famous exports! Meat for döner is cooked on large, vertical rotisseries, and shaved off as it cooks to make a delicious meal. 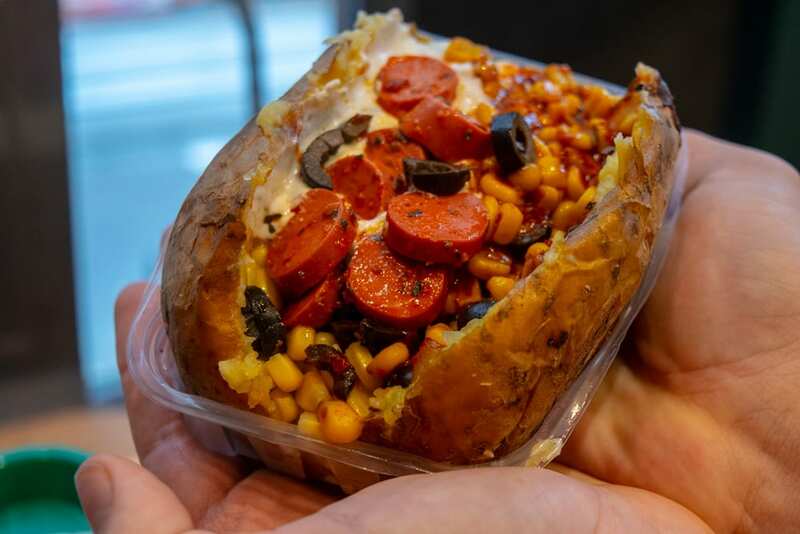 Imagine a baked potato taken to extremes: that’s kumpir. After slicing a baked potato in half, to make kumpir the potato is mixed with copious amounts of butter and cheese. The new mixture is then topped with a huge array of toppings–meat, olives, cheese, pickles, corn… you name it, and it can potentially go in kumpir. 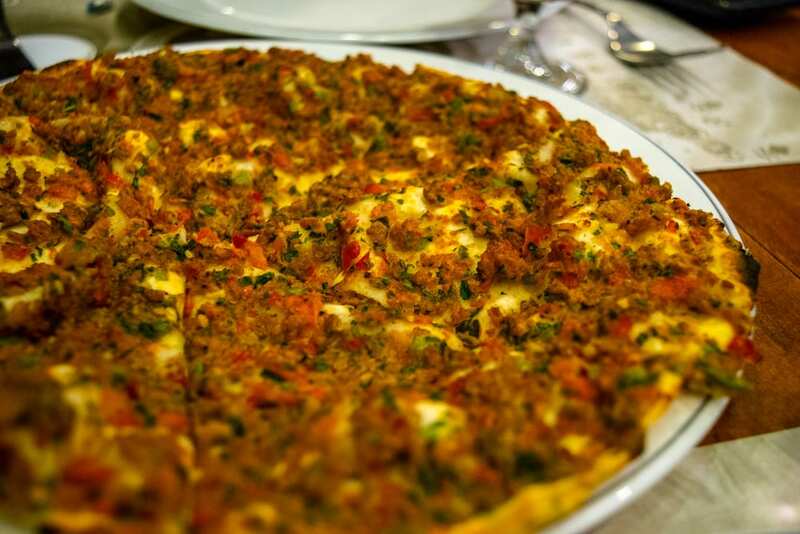 Sometimes (inaccurately) described as Turkish pizza, lahmacun is made up of a thin piece of dough, topped with minced meat, spices, and vegetables. Lahmacun is a popular street food and is often consumed by rolling it up and eating it kinda-sorta like a taco. Balık Ekmek is one of the most popular street foods in Istanbul. Essentially a fish sandwich, balık ekmek is made up of a grilled fish or filet and vegetables stuffed into a hearty piece of bread. Grab one under the Galata Bridge and eat it staring across the water at the Galata Tower for a downright iconic Istanbul food experience! Dumplings stuffed with lamb or beef and topped with yogurt sauce (think sour cream, not Yoplait) and garlic–trust me when I say that this is truly an epic combination. Mantı are utterly delicious, and while their origin is somewhat disputed, there’s no denying that they’re a popular food in Istanbul! Istanbul may not be much of a beach city, but it’s definitely a coastal one–and the popularity of seafood among food in Istanbul definitely shows that. Izgara Balık is fresh grilled fish, usually served whole. 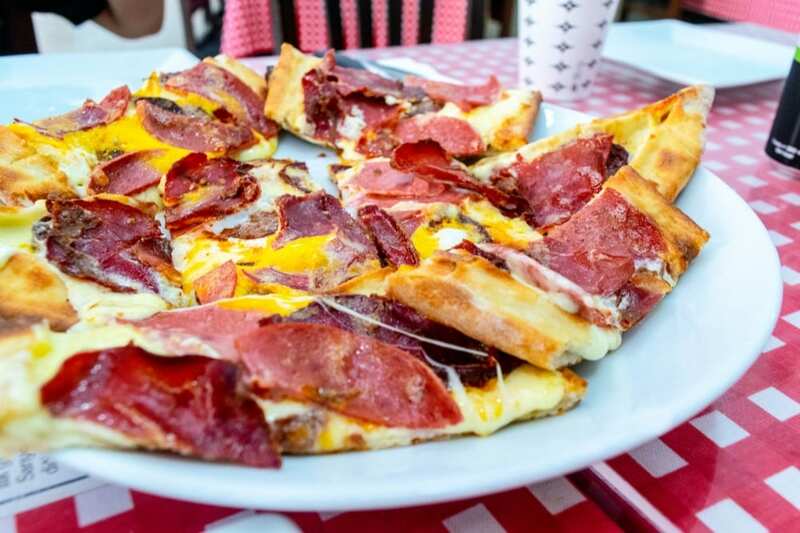 Far more than lahmacun is, pide is Turkish pizza. Cooked in an oval-shaped dough that is folded to hold the ingredients and topped with cheese, meat, and vegetables, it’s essentially a form of deep dish pizza… minus the tomato sauce. Essentially savory baklava, these flaky pastries are stuffed with cheese, meat, or vegetables. Menemen is a popular dish with Turkish breakfast, and it’s tasty–it actually reminds me of some Latin American egg dishes, just with different spices! Made of eggs, tomatoes, green peppers, and spices, it’s a tasty addition to any breakfast in Istanbul. Not all döner is stuffed into a sandwich! Iskender Kebab is made up of döner meat laid over bread, tomatoes, and peppers, and is topped with yogurt and melted butter. It is delicious, and a must-try food in Istanbul! White beans are delicious, but they are especially tasty when served in kuru fasulye! Kuru Fasulye is a stew made up of white beans, olive oil, tomato sauce, and onion, plus plenty of spices. More a food group than a specific food item, meze are essentially appetizers or hors d’oeuvres. Some are served hot, some are served cold, most are served with bread, and all are downright tasty–think of tapas in Spain to get the general idea of their quantity and purpose. Mussels are a popular food in Istanbul and are popularly sold as a street food or in small, casual restaurants. 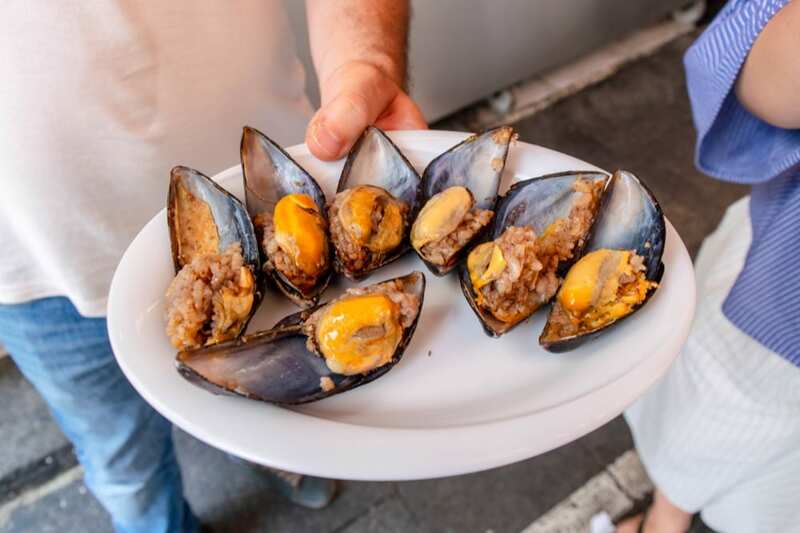 Two varieties are the clear favorites: stuffed mussels, and deep fried mussels. Istanbul is home to some unique drinks–here are the ones you should definitely try while in Istanbul. 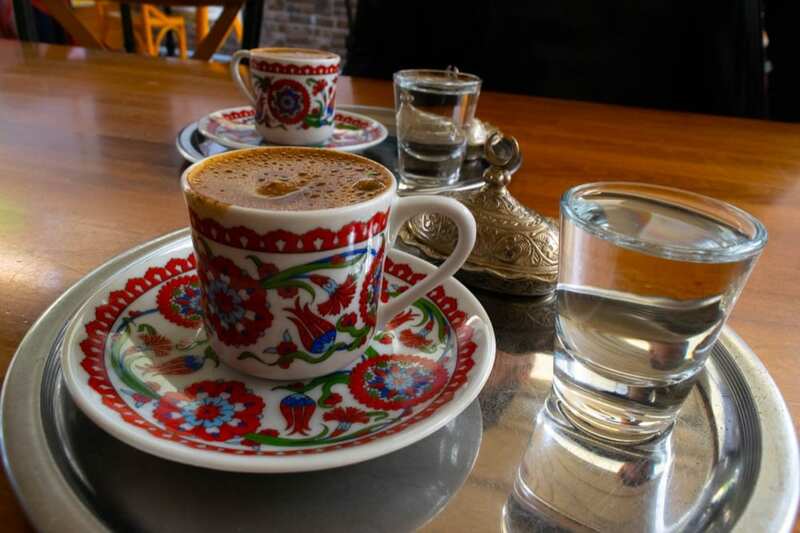 Tea is ubiquitous in Turkey–whether you’re having a meal, or a snack, or even shopping in a store, you’re likely never more than a few feet from one of Turkey’s distinct tulip-shaped tea glasses. If you enjoy tea, we recommend drinking tea every day that you’re in Istanbul–it’s tasty, it’s inexpensive, and it’s absolutely everywhere! 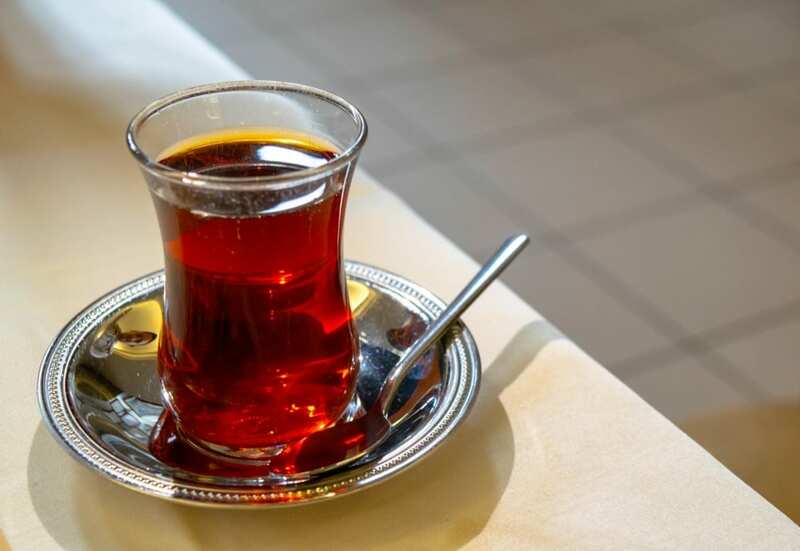 If you want to branch out from basic black tea, consider pomegranate tea–we had some very tasty ones while in Istanbul. They say that ayran is one of those things that you either like or you don’t… and for Jeremy and I, we agree that it’s a very strong “don’t”. Made with a savory yogurt base and salt, ayran has a very strong and distinct flavor. Even if it doesn’t sound like the drink for you, we recommend trying just one sip–experimenting is part of the fun of experiencing the food in Istanbul! Also known as Lion’s Milk, rakı is a strong alcoholic liquor and the Turkish national drink. It’s very strong, not sweet, and is often served with meze. 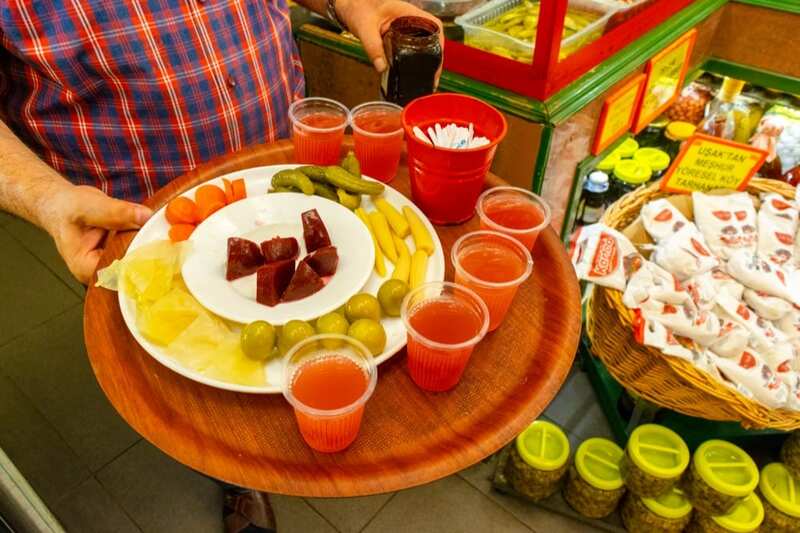 Fruit stands decorated with enormous piles of oranges and pomegranates–some of them cut open to show off their freshness–are common in Istanbul, and these stands are a great place to try a fresh fruit juice that is squeezed right in front of you! Orange and pomegranate are by far the most popular choices, but some sellers will have a whole array of fruits and combinations to try. Made from very finely ground coffee beans in a specific pot called a cezve, Turkish coffee is both extremely strong and extremely tasty. Just don’t drink all the way to the bottom of the cup–the grounds settle in the bottom and the gritty texture is not very pleasant! 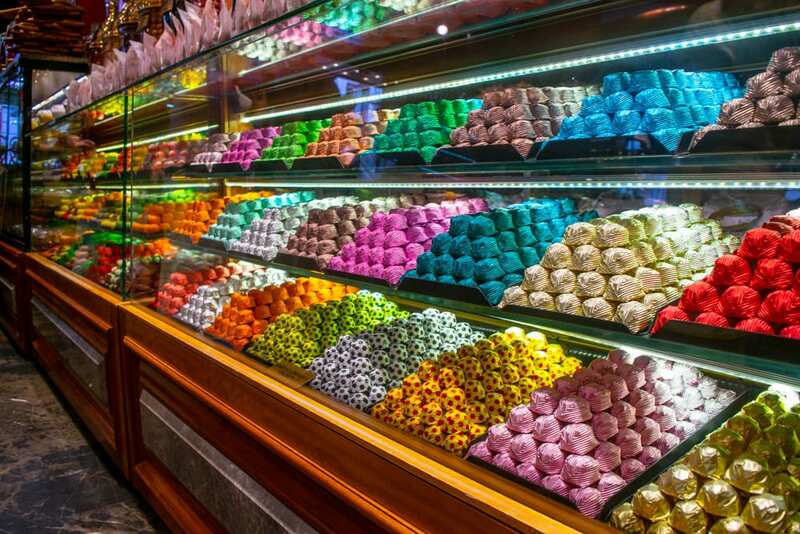 Istanbul loves their sweets–candy and cake shops seem to be on every corner, and the breadth of desserts in Istanbul is enormous. Here are some of the most iconic sweet dishes. The most famous dessert in Istanbul is unquestionably delicious: made of incredibly thin layers of dough stacked on top of each other and then coated in a sugar-syrup, baklava is a treat for sweet lovers everywhere. 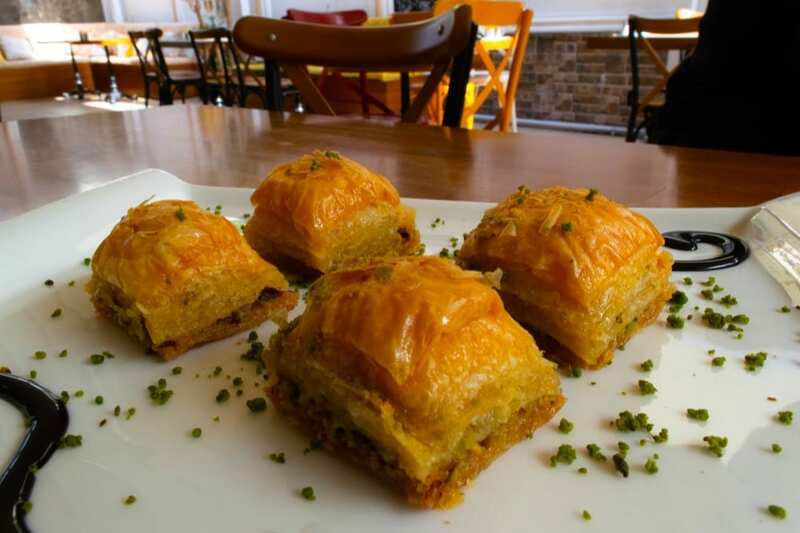 Personally, we think that pistachio baklava is the tastiest of them all, but be sure to try several different kinds to find your favorite! Turkish Delight, to put it simply, is candy. 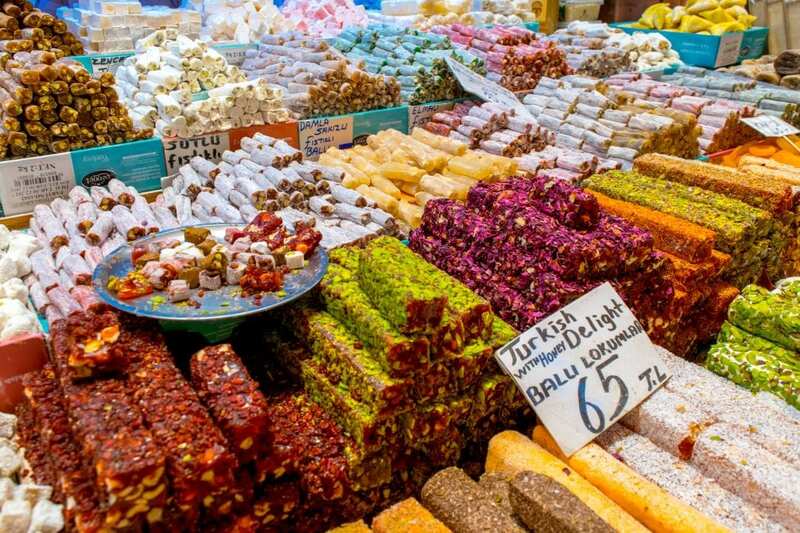 Colorful, bright, and often stuffed with nuts, Turkish Delight (also known as lokum) is essentially made of a gel of starch and sugar–think of a candy that is chewy and sticky, like a gummy bear or similar. The enormous displays of Turkish Delight at the Spice Market make great photo opportunities, and many salesmen will offer samples if you’re looking to try a few bites before committing to a flavor to buy. 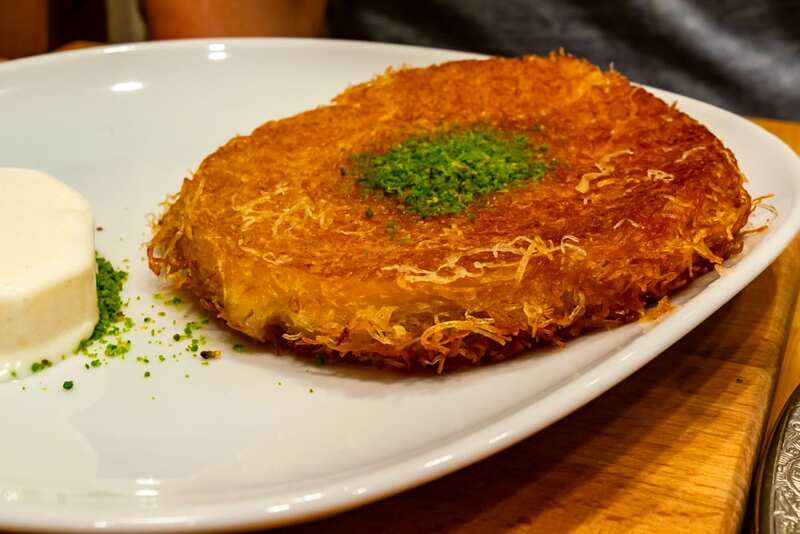 Künefe is made of shredded wheat and cheese–but I promise, it tastes like dessert! Originally from southeastern Turkey, this dessert is served hot and has a very mild flavor. Apricots cooked in sugar syrup and then stuffed with cream–what’s not to love about a dessert as indulgent as this? 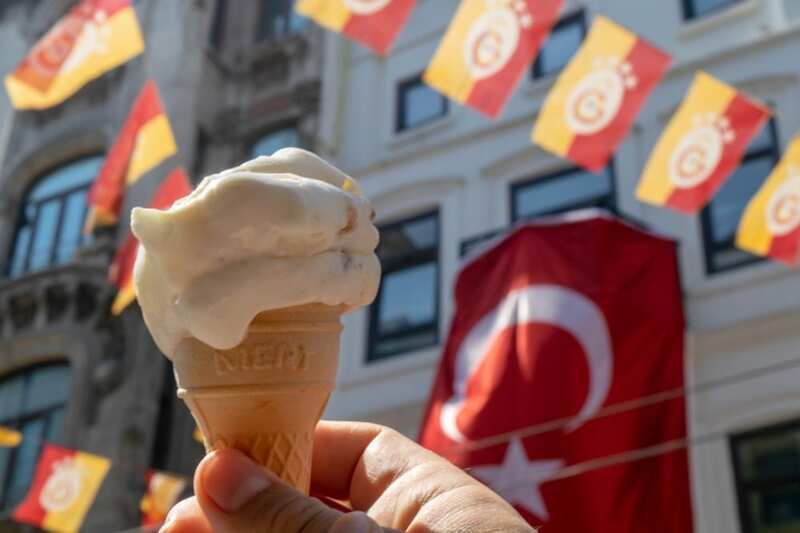 Turkish ice cream, or dondurma, is a bit different than most–it’s chewy! The texture makes it unique among ice creams, and it is a tasty treat (especially if you’re looking for the best food in Istanbul to try during a hot afternoon). Dondurma is typically served either in a cone or sliced (yes, sliced!) onto a plate–personally, I prefer the sliced format. Also known as Noah’s Pudding, aşure is a sweet porridge that is typically made up of a mixture of fruits (including dried fruits), nuts, and grains. A pudding made with chicken meat that is also a totally delicious dessert–nope, I’m not kidding. about any of that! Tavuk göğsü tastes almost like rice pudding–it is thick, delicious, and was once a delicacy served to Ottoman sultans. 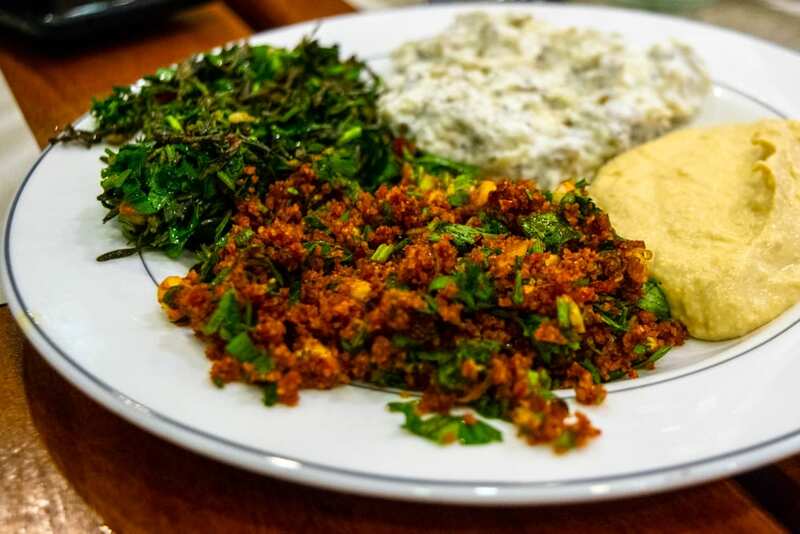 It may sound a little strange to our modern palettes, but it’s also one of the foods in Istanbul that I think everyone (who’s not a vegetarian, anyway) should most certainly try: it’s unusual, and yet the ingredients are familiar to just about every culture and not very intimidating. Deep-fried doughnuts coated in honey or sugar syrup–what’s not to love about Lokma? Fun fact about the Turkish language: “pasta” in Turkish translates to “cake”! 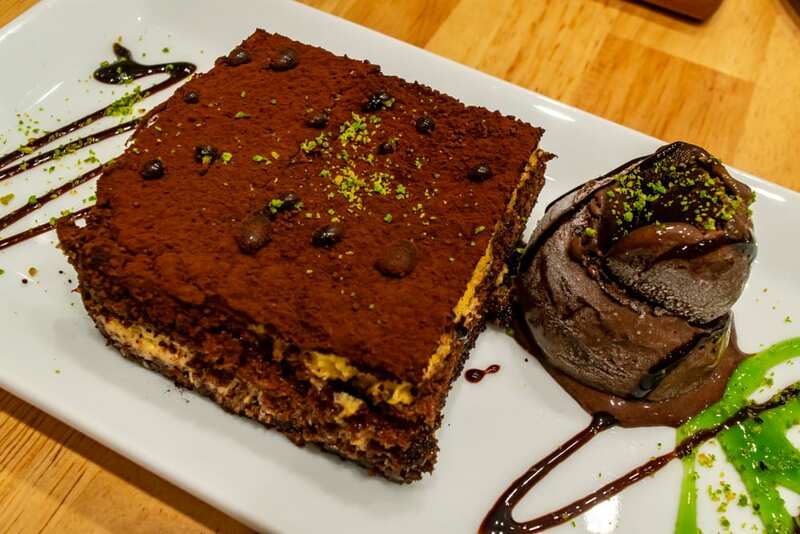 Pudingli Pasta is a Turkish cake made with chocolate. Don’t leave Istanbul without trying out these incredible food experiences! A food tour is the perfect way to get introduced to the best food in Istanbul. We recommend scheduling one toward the beginning of your trip so you can use your new knowledge to help you order great dishes and explore the food in Istanbul throughout your trip! If you’re looking for an excellent tour company, we can’t recommend the well-reviewed Istanbul on Food enough, and they have several food-centered Istanbul tours to choose from! 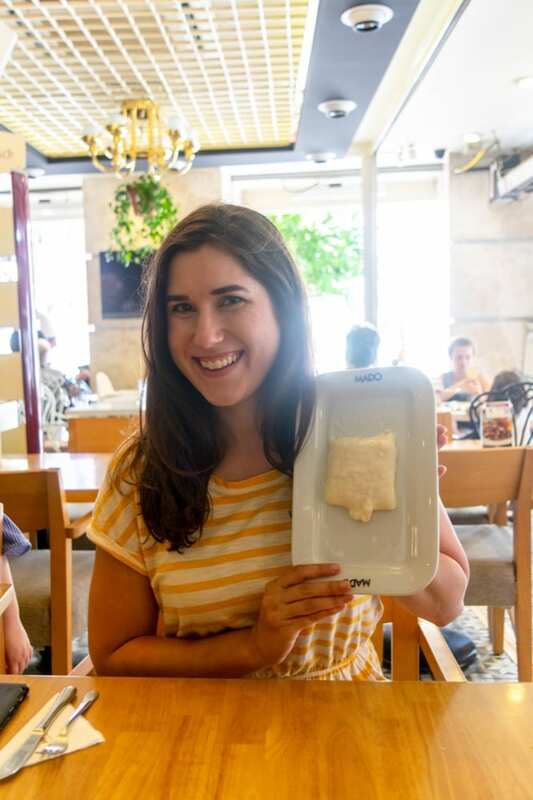 We are enormous fans of taking food tours around the world, and even after taking them on several continents, we were still blown away by our experience when we were invited out with Food on Istanbul. We spent nearly seven hours with them on their Taste of Two Continents Tour, and by the time we finished exploring food in both the European and Asian sides of Istanbul, we were so stuffed that we could hardly move! Beyond the delicious Istanbul food and detailed information provided by our fabulous guide, we adored how laid-back the tour was: the group is capped at seven people (we had six), and we moved only as fast or slow as the group wanted too. Picking up extra drinks or bottles of water throughout the day wasn’t an issue and was all covered by the tour without blinking an eye. They’re very serious about having the tour be all-inclusive–at one point, one of our group members asked about a certain dish, and even though it wasn’t on the tour plan, they brought some out for us to try anyway! We finished our day incredibly satisfied and with a list of new-to-us dishes to work into our meal rotation during the rest of our time in Istanbul. Indulge in several Turkish breakfasts. If there’s one thing in Istanbul that you absolutely have to eat, it’s Turkish breakfast. The Turks take breakfast very seriously (my kind of people!). 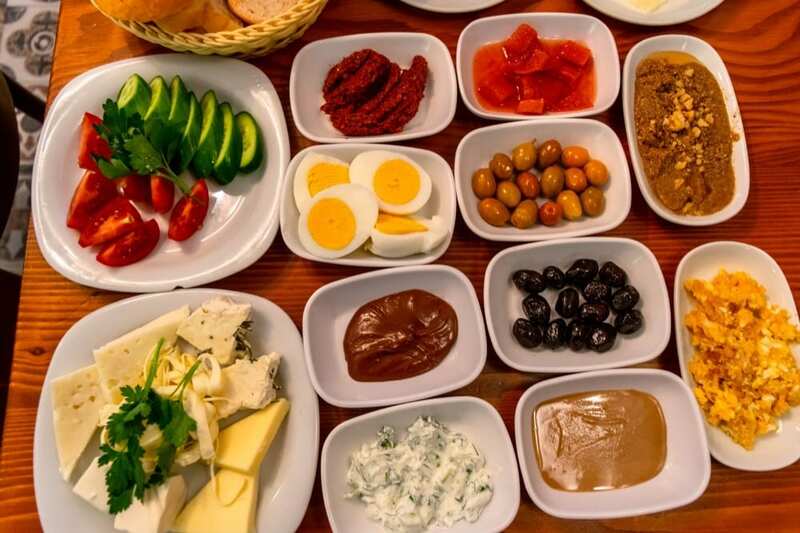 Turkish breakfast is made up of eggs (often cooked into menemen, sometimes fried or hard boiled), sausage, breads, spreads and jams, honey, olives, multiple cheeses, and–of course–buckets and buckets of tea. 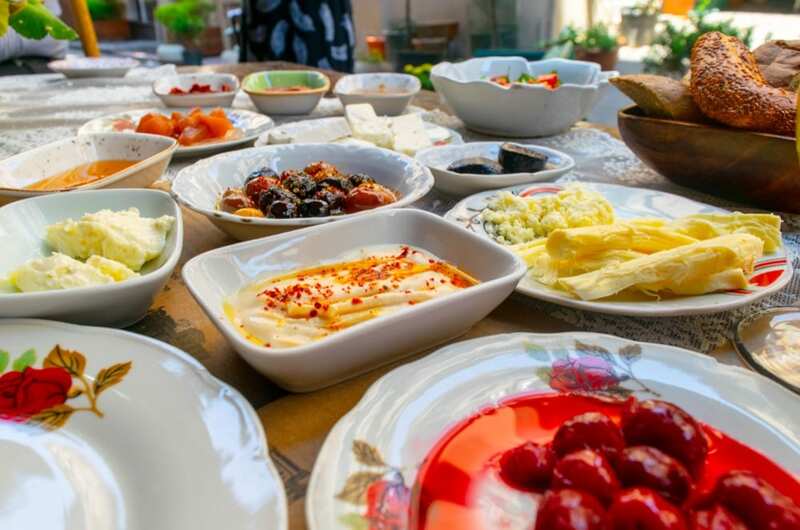 This is a meal worth lingering over, so make sure you have the time (and room in your belly) for at least one fabulous Turkish breakfast while you’re exploring the food in Istanbul! 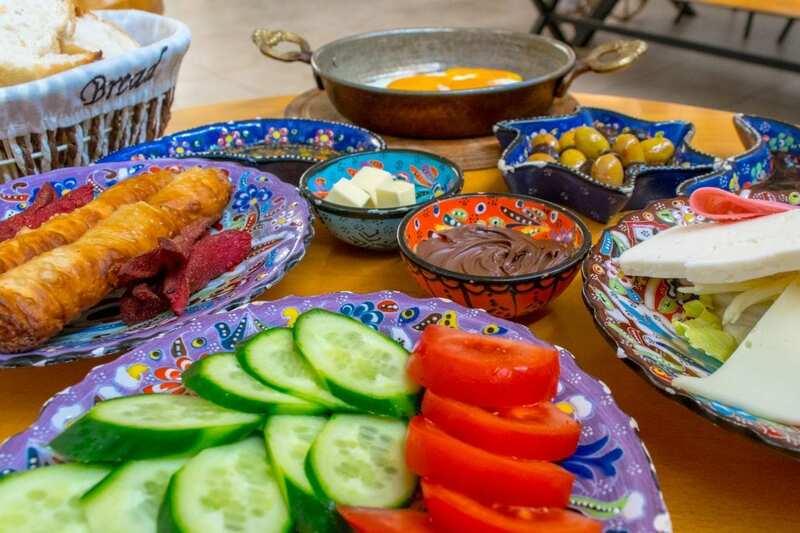 If you’re looking for a great Turkish breakfast spot, you can’t beat the popular Van Kahvalti Evi: with great prices, great service, excellent food, and consistently prompt delivery of their unlimited tea, it’s no wonder that this place is always packed with tourists and locals alike. Try out a cooking class. Want to say goodbye to eating in restaurants and get your hands dirty? Istanbul has tons of fantastic cooking classes, all ready to teach you about how to recreate the best food in Istanbul once you go home. Be sure to read up on what dishes the class includes if you’re hoping to make a specific item! 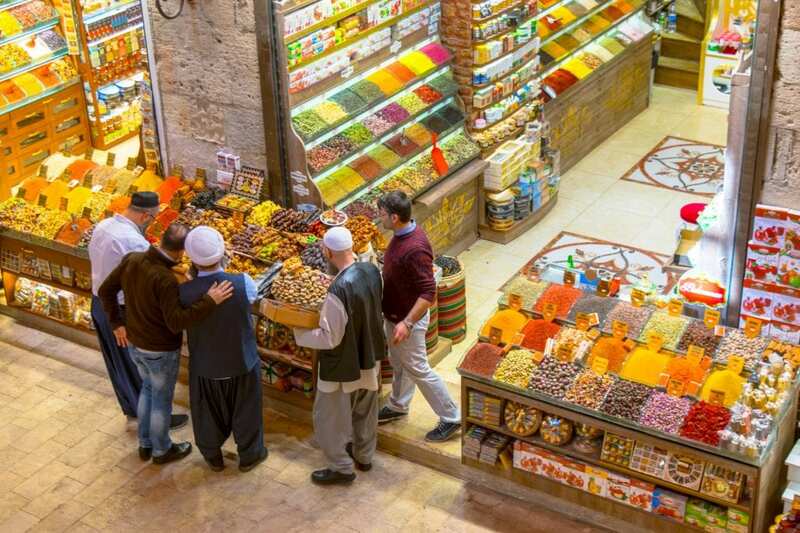 Wander through the Spice Market. It may be touristy, but the Spice Market is one of our favorite spots in Istanbul: it’s beautiful, it smells delightful, everything is completely photogenic, and it simply feels like a feast for the eyes (and sometimes the belly!). While you’re there, be sure to explore the exterior of the market on the west side of the building–this is where you’ll find a slightly more local feel, sellers with varying wares like fruits, vegetables, cheeses, and olives, and even a stand selling copious amounts of Turkish coffee grounds if you’re hoping to take some home! 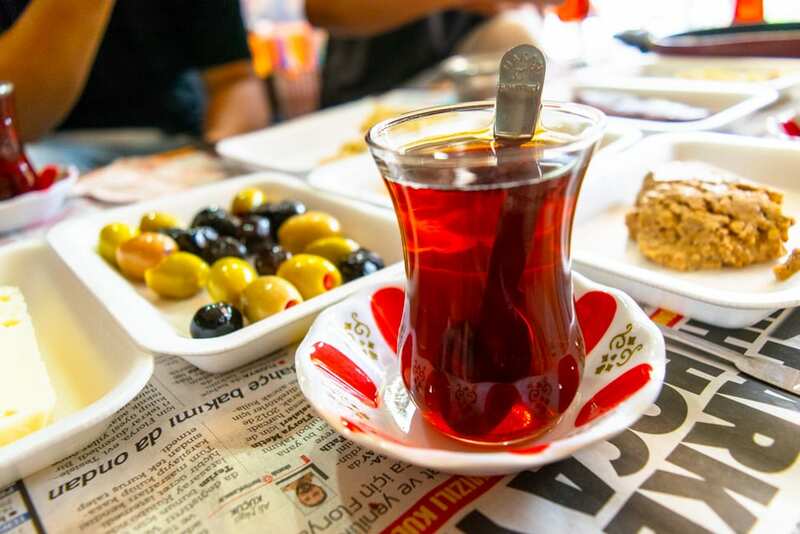 Having tea with a shopkeeper is a common practice in Istanbul and a fantastic way to explore the city–many shop owners love sitting down and chatting about just about everything with the people passing through their place of business. Will partaking in tea with a shopkeeper, especially in touristic areas like the Grand Bazaar, up the pressure to buy something? Yes, absolutely–though you are still under no obligation to purchase, and most shopkeepers will never be unpleasant about it (just persistent!). If you want to enjoy the experience while also avoiding pressure to buy, consider waiting to accept an offer of tea from someone you already planned to make a purchase from. Non-touristic businesses can be even better for this kind of thing–Jeremy once had a lovely, hour-long conversation over tea with a shopkeeper when he dropped off our laundry with him! Attend dinner in a local home. Whether you book a planned experience or you just happen to have friends in Istanbul, you can see a completely different side of the city–and of the food in Istanbul–by dining with a family in a local home. Host gifts–usually a small dessert, like baklava or chocolates–are the norm for visiting other families for a meal in Istanbul. Book a dinner in a local Istanbul home today! Test your sweet tooth on a dessert tour. All the Turkish desserts making your mouth water? Consider heading out on a tour specifically centered around desserts when you explore the food in Istanbul! Turkish desserts are one of our favorite parts of the cuisine (and that’s really saying something), and a dessert tour can be the perfect way to learn all the ins and outs of the delicious pastries, puddings, and beyond. Just be prepared for a sugar rush, because you’ll definitely have one by the end! Have a meal at Asitane Restaurant. Asitane has one of the most interesting restaurant concepts we’ve come across in our travels, and that alone makes it worth a visit. 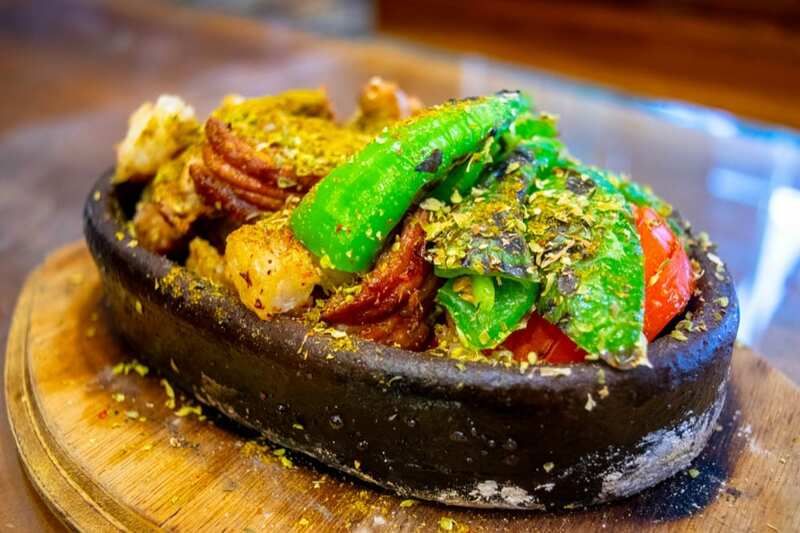 Asitane specializes in recreating the delicacies and intricate dishes that would have been served to Ottoman sultans throughout the reign of the empire, making a visit to Asitane a meal and a history lesson in one. If you’d like to taste centuries-old dishes while exploring some of the best food in Istanbul, be sure to visit Asitane! Many thanks to Istanbul on Food for hosting us on their Taste of Two Continents Tour! All opinions and food comas are, as always, our own. Incredible! This article is making me really hungry. Do you have a good manti spot in the city to recommend? Thank you! We had some delicious manti at Ficcin near Istiklal. Great list of foods. 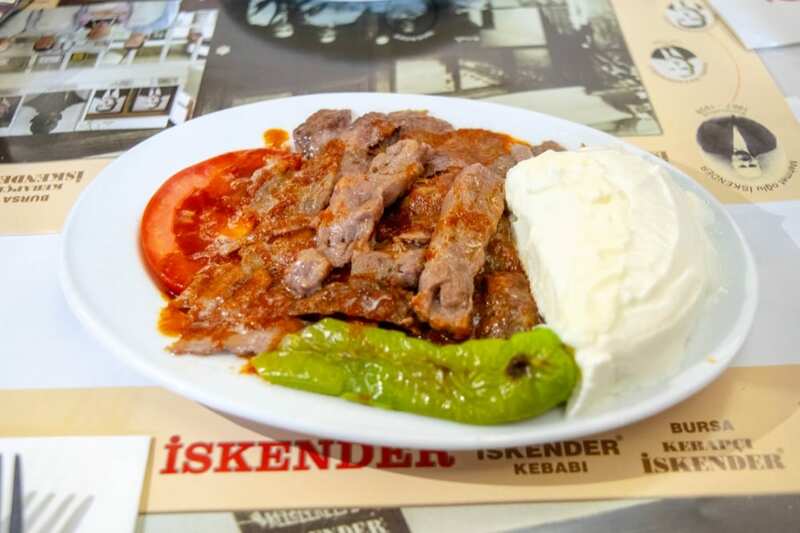 İskender kebap is especially my favorite in Istanbul. Thanks, Farid! Iskender kebap is definitely delicious!